"If you're good, you can get noticed, but you will not get noticed if you stay in your basement, and you will not get noticed if you over analyse everything you do. You have to go and do it." For many, the allure of the music industry is one of fame and fortune, brought on by slick images used to promote the artists who make their way into the nation's living rooms via our television sets. The reality of the industry is that the overwhelming majority of artists never make it big, despite the years of dedication and perseverance they may endure in the pursuit of their dreams. Even with the greatest of talents, success in this business is a crapshoot at best, relying as much on timing and good luck as underlying skill, along with dogged determination and a whole lot of plain old hard work. While the industry revolves around the personalities that make up the artist roster, the heart of the business is in selling the song, a process that requires the talents and services of a wide range of people in order to make a project successful, from A&R, promotion and marketing to publicity, sales and distribution, the people behind the scenes are what put the "business" in the music, and without them, there is no business. Recognizing the demand for an inside look at the industry, the world's largest record company, Universal Music Group and print publishing giant, Penguin Putnam, teamed up to produce a distance learning program to help people aspiring to a career in the music industry get advice from the pros on everything from making a demo, to what it takes to work in the promotion department. 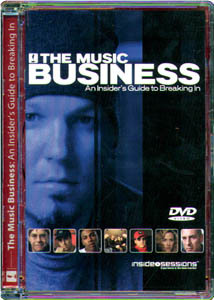 The Music Business: An Insider's Guide To Breaking In is a collection of interview clips from heavyweights in the industry, from pop stars like Elton John, Sheryl Crow and Sting, to record executives (including Sony chairman and CEO Tommy Mattola, Interscope Geffen chairman Jimmy Iovine, and Doug Morris, chairman and CEO of Universal Music Group), producers, engineers, lawyers, agents and personnel from the various departments that make up a record company. The personalities cover many genres of popular music, from rock to rap, from indie artists to major label acts, each giving their perspective on issues surrounding a career in music. The disc is broken into four main topics: How to Get In, The Art of Music, The Business of Music and Inside a Record Company, each of which breaks out into further subcategories. A lot of ground is covered, from advances to royalties and recoupments, to the names for different jobs associated with selling music. While no one should expect to be able to learn everything from a DVD, this disc does offer up some useful and practical advice, some of it so obvious everyone misses it, some a little harder to come by. With the history of the industry overflowing with tales of artists who squandered their riches, lost them to unscrupulous record companies, or signed their lives away over a few beers and the lure of a recording contract, the content here primes those thinking about a career in music from both the artistic and support sides. The tone is casual, but the message is direct. It is interesting to see people like Sting or Elton John casually discuss losing millions of dollars in income to the parasites that feed off the entertainment industry, but their experience is a big part of what this disc, and the optional courses offered by Inside Sessions through their website, are about. There is no concrete game plan set out here, only ways that have worked over the course of the last several decades, and it was nice to see some opposing opinions presented, to give an idea of the choices that must be weighed in dealing with the business aspects which are paramount to making a living as an artist. It was also nice to see attention paid to the career opportunities available in the hundreds of support positions that artists rely on to achieve their goals, for those who don't want the spotlight, but still be part of a successful project. Whether you expect to be selling millions of albums, or would like to behind the scenes with those who help realize someone else's dream, there is something here that can be of use. It may not make you rich in and of itself, but knowledge is power, and in an industry as cutthroat as the music business, every little bit helps. Image Transfer Review: The disc consists of footage from a number of interviews, and overall image quality is very good. Colors are strong, black levels solid, and there are no defects to mention. For a disc like this content is definitely more important than the presentation, but there is little to complain about in that department. Audio Transfer Review: Audio is clear and easy to understand throughout, with no technical problems to speak of. The overall tone is consistent throughout, despite the multiple interview sources. Background music is fairly unobtrusive, and doesn't obfuscate the dialogue. Extras Review: The DVD comes in a Super Jewel Case, which houses a 24-page, full color book giving short biographical material on the disc and course's personalities. Menus function well, though I would have preferred the disc return to the main menu after completing a full subsection. A good introduction to the music industry from those inside it. While a few of the personalities came off a bit too self-aggrandizing for my liking, for the most part there is some sound advice contained here, and a general overview of the pieces that go into marketing and promoting a song. Recommended for anyone interested in the workings of this entertainment industry.